The record volumes of gas supplied via the OPAL and Nord Stream pipeline in recent weeks have been accompanied by controversy over the rules for utilisation of the OPAL pipeline’s capacity. There has long been uncertainty as to the actual content of the decision taken by the European Commission at the end of October 2016, the full text of which was published on 9 January 2017. Both the clash of interests between companies and states about how to use the gas pipeline, and the different interpretations of the impact of Gazprom’s increased utilisation of OPAL due to the new EC regulations on the situation on the gas markets in the EU, including in Central Europe and Poland, have been revealed. Uncertainty concerning the principles of the pipeline’s use has also been increased by Poland’s formal challenge of the EC’s decision. The decisions by the European Court of Justice and a court in Düsseldorf related to this matter, which temporarily suspend the implementation of the EC’s regulations, have not yet been published. This deepens the doubts about the principles for increased utilisation of the OPAL pipeline, and about the legality of the increase in gas flows along the route which has been apparent since 22 December. At the same time, these gas flows are affecting the situation on the European (and especially Central European) gas markets. OPAL’s record fill-up translates to a record usage of the Nord Stream pipeline, as well as an increase in the role of Germany and the Czech Republic in the transit of Russian gas to the EU, especially to Central and Eastern Europe. This in turn affects the changes in gas flows in the Central European region, and reduces the transit role of Slovakia and Ukraine. The increase in the utilisation of the OPAL pipeline, which changes the situation on the Central European gas markets , raises questions about how to increase these markets’ competitiveness and supply security. The controversies connected with the principles of using the pipeline reflect more substantial controversies within the EU concerning the key challenges and objectives of the EU’s security of gas supplies policy, in particular the role which should be played by Gazprom and deliveries of Russian gas, as well as the particular delivery routes. The EC’s interpretation of security of gas supplies visible in its October decision seems to be closer to the position of the supporters of normalisation, or even reinforcement of gas cooperation with Russia (by implementing the Nord Stream 2 pipeline, among others), despite the existing disputes at the political level, as well as of strengthening the role of Germany on the Central European gas market. At the request of the German regulator BNetzA, and after years of negotiations, on 28 October 2016 the European Commission announced new rules for the use of the OPAL gas pipeline (see the Appendix; for more, see Agata Łoskot-Strachota, ‘The European Commission enables increased use of the OPAL pipeline by Gazprom’, OSW Commentary, 9 November 2016). The full text of the EC’s decision was only published on 9 January, which raised a series of questions about the publication procedure and transparency of the whole process, and about the details and consequences of the decision for the parties concerned, including actors from Poland and Ukraine. Even before the EC’s decision was published, the parties interested in how the pipeline was to be utilised had already taken a number of steps. On the one hand, on 28 November, the conditions of OPAL’s use were adapted to the EC’s new regulations by the pipeline operator, and on 19 December the first capacity auctions based on these rules were held (see below). On the other hand, the Polish gas company PGNiG and the Polish government applied to have the implementation of the EC’s decision halted, and challenged it at the European Court of Justice, deeming it a threat to the competitiveness and security of gas supplies to Poland and the whole of Central & Eastern Europe. PGNiG also lodged a complaint with a court in Düsseldorf, Germany. As a consequence, according to PGNiG’s statement, on 23 December the EU Court of Justice ordered a temporary halt to the implementation of the EC’s decision concerning OPAL, and requested additional clarification from the parties to the proceedings, i.e. PGNiG and the EC. After this is clarified, the Court is supposed to take a final decision as to the possibility of maintaining the suspension of the application of the EC decision until the plaintiff’s case has been considered. A week later, on 30 December, a similar decision was taken by the court in Düsseldorf, and the German regulator Bundesnetzagentur (BntezA) implemented it; this move should result in the temporary suspension of any further capacity auctions based on the new rules (see table in Annex). · how long the Court of Justice (and the German court) will maintain the (currently temporary) suspension of the implementation of the EC’s decision on OPAL. OPAL is a pipeline in which the capacity booked at the point of entry may vary from the capacity booked at the point of exit. This is because some of the gas from OPAL may be sold via Gaspool without any concrete points of exit being booked. In addition, OPAL has a physical connection with the Jagal and Ontras networks, and can thus transfer some gas in either direction. Consequently, in the case of OPAL, volumes of gas that enter the pipeline at Greifswald usually differ from those which exit at Brandov. 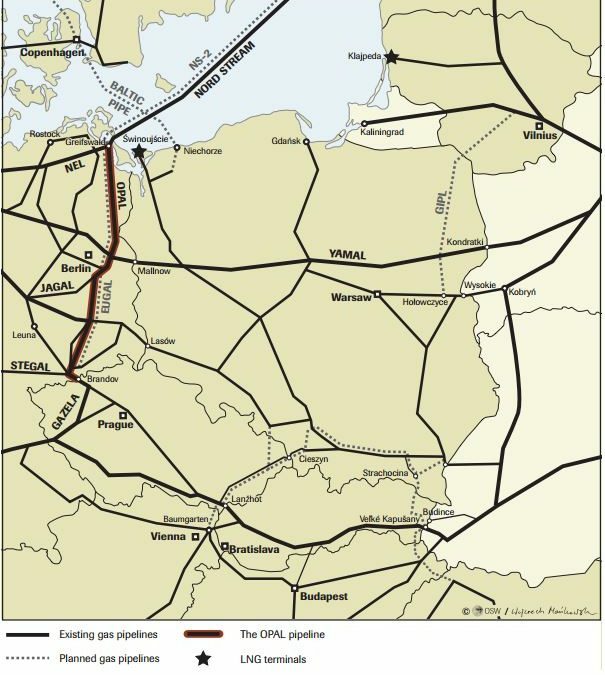 In particular, until recently, due to the supplementary filling with gas flowing from the Gaspool area, it regularly occurred that more gas exited the pipeline at the Czech/German border than had entered it in northern Germany (see Appendix, Figure 1, for the period from 1 to 22 December). at the Brandov exit point, from an average of 64.5 mcm per day during 1–22 December (the equivalent of 22.3 bcm annually), to levels sometimes in excess of 90 mcm/day (equivalent to 31.1 bcm annually). Only on 31 December 2016 was a temporary decline in the pipeline’s use apparent. · according to reports from Energate, the operators Net4Gas and OPAL Gastransport also offered a bundled product corresponding to 10% of the pipeline capacity belonging to OPAL’s operator, although none of the 3.2 GWh/h was sold. The capacities sold at Greifswald equal the sum of the capacities sold at Brandov, and come to around 28.5 mcm per day (and 10 bcm annually). In the interpretation of the media and the energy market intelligence providers, all of the capacities sold were most likely bought by Gazprom. In connection with the suspension of the next auctions until the final judgement by the court in Düsseldorf on PGNiG’s complaint, and the lack of legal certainty as regards both the duration of the suspension and a final judgement on the complaints by the Polish side, it is not known whether the next auctions of the above-mentioned monthly products will take place in January/February. It is known that auctions at PRISMA of the same capacities are scheduled for 6 March 2017, but for a much longer period – most likely a period of 15 years (the maximum allowed by EU regulations), broken up into one-year pieces. The capacities sold at auction on 19 December for the whole of January explain (leaving aside the current legal doubts) the rise in gas flows via OPAL as of 1 January. Consequently, the pipeline has seen record levels of usage, and the same is also true for the Nord Stream gas pipeline. According to media reports, in early January Gazprom supplied 165.2 mcm of gas per day via its Baltic Sea route, using more than 100% of the total technical capacity of the Nord Stream pipeline during 4-6 January. The sharp drop in flows on 31 December was most likely because German regulator’s decision to stop the OPAL capacity auctions (see table in Appendix) had come into force on the previous day (30 December). Nevertheless, it is still unclear why the increase in flows on 22–30 December was just as sharply marked, and on what basis it took place (for example, whether it was connected with the use of capacities unused throughout the year on the basis of the old regulations, or with the daily auctions organised according to the new regulations). For the rest of the comment and other information on OSW (Centre for Eastern Studies), please refer to www.osw.waw.pl.